Heart disease is the leading cause of death for both men and women in the U.S. Understanding heart disease is complicated. Family history, diet, and lifestyle all play important roles in its progression and manifestation. With the rise of the use of statin medications, it is worth understanding how such medications can be avoided and reduced given their negative side effects. What are some natural approaches to reducing the risk of heart disease? There is no question about the central role that diet plays in preventing and treating heart disease. Being thoughtful about your consumption of fat and sugar is key. Fats and oils are made of fatty acids. Fatty acids such as the omega 3 families promote health and help prevent degenerative diseases. However, most Americans consume insufficient omega 3 foods and eat excessive amounts of saturated fats from other animal sources. These saturated fatty acids are implicated in heart attacks, strokes, and cancer. Foods high in omega 3 fatty acids should be increased or added to the average diet. · Salmon, trout, mackerel, & sardines · Oils of cold-water fish · Flaxseed oil Foods high in omega 6 fatty acids are also beneficial, though excessive amounts of omega 6 fatty acids may promote cancer. · Safflower oil, sunflower oil, pumpkin seed oil, soybean oil, walnut oil, wheat germ oil, sesame seed oil, rice bran oil in descending order. · Supplements – evening primrose oil, borage oil, black currant seed oil Foods high in monounsaturated fatty acids should also be increased. · Olive oil, Canola oil, Almond Oil Foods high in saturated fats should be avoided or decreased. · Beef, mutton (lamb), pork, poultry, lard · Butter · Coconut oil, Palm oil & Palm kernel oil · Cocoa butter, shea nut oil · Eggs, cheese (except not-fat cheese), milk (except skim milk), ice-cream · Processed foods To reduce your saturated fat intake, consider a few dietary changes. Avoid or reduce your consumption of red meats, eggs, dairy products (except non-fat), add processed foods. Choose healthier protein sources such as fish and legumes (dried peas and beans) instead. When consuming meats, use lean cuts and trim excess fat, including poultry fat. Use a fat separator (strainer) when making gravies or soup stock. Use skim milk or fat-free yogurt and cheese instead of regular dairy products. Increasing fruits, vegetables, and whole grains will reduce fat intake. Finally, broil, bake, boil, or water-sauté foods instead of frying. To water- sauté food instead of stir-frying in oil, put ½ to 1 cup of water or stock into a wok or skillet and bring to rapid boil. Quickly add vegetables and keep stirring over high heat until done. Sugar’s role in increasing inflammation has gained a lot of attention recently with conventional cardiologists. Inflammation can be linked to most chronic diseases. The simple carbohydrates in refined wheat products promote inflammation. The higher the intake of refined foods and sugar, the higher the systemic inflammation in the body. When blood vessels are inflamed, they lay plaque in the vessels to protect themselves. Arties clogged with plaque cause heart disease. Cholesterol only causes heart disease in the form of plaque. So if cholesterol is already high, decreasing inflammation is vital. Here are a few simple ways to lower blood sugar and balance inflammation. Eat small, frequent meals focusing on fat, fiber, and protein. Avoid simple sugars in the form of wheat or sugar. Increase fiber intake to decrease rapid rises in blood sugar. Legumes, oat bran, nuts, seeds, psyllium seed husks, pears, apples, and most vegetables are high in fiber. In addition to diet, exercise and stress management are important ways to reduce your risk for heart disease. The American Heart Association suggests at least 150 minutes per week of moderate exercise or 75 minutes per week of vigorous exercise. Thirty minutes a day, five times a week is an easy goal to remember. Remember, the heart is a muscle and in order to optimize its function, exercising it is vital. Stress management could be considered the most important piece to heart heath. Often there is little we can do to control the external stressors in our lives, but we can support our body’s response to stress. Exercise, medication, prayer, sleep, and social support are all ways to reduce feelings of stress. Finally, there are a number of supplements designed to be heart healthy with studies showing their role in optimizing cardiovascular function. These include magnesium, CoQ10, fish oil, acetyl –L-carnitine, hawthorne and other herbs, and plant sterols. With the wide variety of nutrients and herbs available, it is important to speak with your natural health care provider to develop a treatment plan the considers your unique needs and goals. 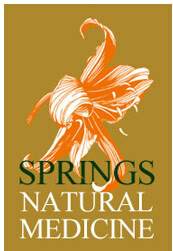 Contact us today at 719-685-2500 or info@springsnaturalmedicine.com to schedule a FREE 15 minute meet and greet with one of our doctors.